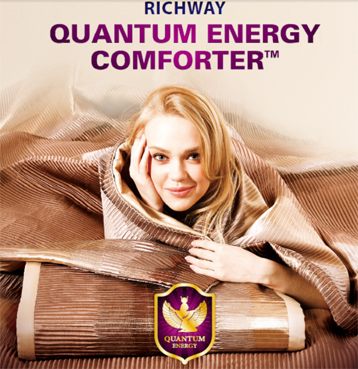 The new Richway Quantum Energy Comforter is the most unique bedding product to be made recently. It combines the healing that Richway is known for with quantum energy produced from grape seeds and peach pits with the infrared and negative ion therapies generated by amethyst and tourmaline. This comforter has individual quantum energy, tourmaline and amethyst layers that combine their organic properties to form this one of a kind product. Amethyst has been used since ancient times to heal chronic aches and pains, toothaches and is known as "nature's tranquilizer". The Amethyst emits Far Infrared Rays known for their healing power for multiple ailments. Richway's banner product, the Biomat, has enjoyed nearly two decades of success. The infrared and negative ion therapies produced by the Biomat can now be enhanced with the help of the NEW Quantum Energy Comforter also made by Richway. This environmentally friendly comforter is made with six separate layers of technology to compliment your time on your Biomat. The Quantum Energy Comforter is lightweight, soft and harnesses nature to help you relax and get good sleep. The cover of the comforter can be removed and machine washed for convenience.